The charming historic beach town of Galveston is located 50 miles south of Houston, the island is home to 32 miles of beaches making it an ideal location for water sports enthusiasts. Galveston is rich in history and has one of the largest and well-preserved concentrations of Victorian architecture in the US. Explore, discover and have plenty of fun at this educational attraction, Moody Gardens has a theme park, a large aquarium, an educational Discovery Museum, 3D theatre, 4D Special FX theatre plus the added attraction of a Palm Beach with it’s white sandy beach and freshwater lagoons. East Beach is the largest beach in Texas, located on Galveston's most upper East side, the beach is famous for its great festivals and live concerts held in the summer months and it offers fantastic views of the Gulf and the Bay. 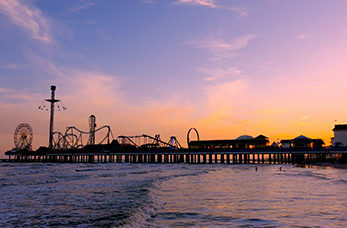 The Galveston Island Historic Pleasure Pier features family orientated attractions including a 100 foot tall Ferris wheel, a steel roller coaster and a 200 foot tall swing which is the highest ride in Texas as well as food venues and retain shops. This National Historic Landmark is Galveston's best known building, known as "Gresham House" the house is one of the most significant Victorian residences in the country.